Q. What is the main difference between Indian and west astrology? Have you studied both of them? A. In Indian astrology we study the moon signs, and in western astrology the sun signs are considered. (A Moon sign is the zodiac sign in which the moon is at the time of birth.Moon signs are more closely related to a person, as the moon enters a new sign every 2 ¼ th days, and the moon rules the mind. To find your moon sign check in which zodiac sign the moon is in your natal chart. I have studied both, but my speciality is mainly moon signs. Q. What is your qualification as an astrologer? 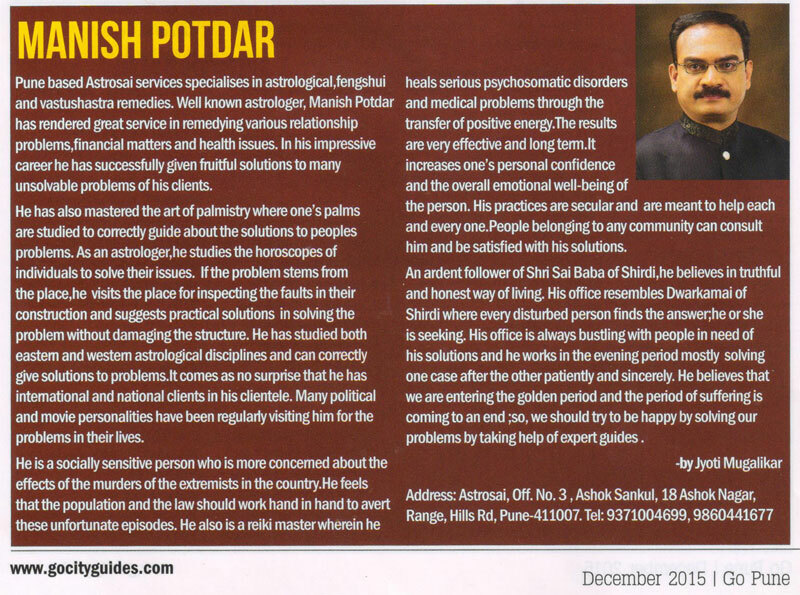 A. I have done my Jyotish Visharad from Maharashtra Jyotish Parishad, which a recognised body of Astrologers. I have been honoured with the title of ‘Mahopadhyay’ in Palmistry. I am a certified gemmologist from VJTI Pune, Maharashtra, India. Q. Do you think that somebody can change the fate that stars have decided about him/her? A. There is always an element of Karma or self will which can be used to understand and take appropriate measures to modify the course of an otherwise definite outcome. The horoscope is a guide which tells us about the inclinations of the person in terms of his potential of progressing, or degressing from this basic reference point. This can be with reference to his mental attributes, his health, interpersonal relations, fame, wealth, success etc. A horoscope can predict the possible dangers and risks in specific areas in a person’s life, so that he can take measures to prepare himself and find alternative ways for the same. Q. What is the connection between astrology and gemmology? Can we mix them? A. Ancient Indian astrologers have associated specific gemstones with planets. This intriguing art has proved itself extremely effective, innumerable times. The correct choice of the gemstone is done on the basis of study of a person's horoscope.The planets that are having an unduly negative effect can be ameliorated, and the helpful influences of the other planets enhanced. It has been seen that the right gemstone has a positive effect on a person's life, helping him to be more stable, positive, courageous, enthusiastic, prosperous and lucky. Such use of gemstones has first been mentioned elaborately in the ancient Rugveda, Devi Bhagwat, Mahabharat, and Agnipuran. The poetry of Kalidas the famous ancient Indian poet, and other Vedic literature gives details about the use of gemstones. The base on which Indian Astrology rests is the Brihatsanhita by Ayaryavrahmihir, has also elaborately described the right way of the use of gems. Q. Can we cure somebody with gems and crystals? How does it happen? A. There are seven chakras, or energy points in the human body. Each chakra relates to certain organs , and a proper balance of these chakras is essential for having a healthy , productive and happy life. Each chakra has its own colour. In crystal healing, crystals of the required colours are used to enhance the energy level of the chakra.This in turn helps to remove negative influences on the individual. This also helps to remove toxins from the body and enhance health.The human aura is greatly enhanced, and can have a great impact on others in a positive way. The human body is like a crystal. It can absorb and radiate energy. Use of appropriate crystals is made to balance, stimulate or sedate the chakras as required. Q. How can we connect with cosmic energy? What happens to modern people and forget their connection with nature and world? A. We can connect with cosmic energy with meditation and Reiki. Modern people are tending to become more materialist and material gain oriented. Some of them have forgotten their spiritual origin ,want to be superior to others and gain a lot of wealth and materialistic comforts. In short they are running after those things that give no lasting peace and enlightenment. Q. How can a palmist see what happens to other people’s lives? Do the lines of the palm change? Do we provoke it or our fate? A. A palmist is able to tell with good accuracy the incidences of a person's past life, and those that will occur therefrom. Forewarned is forearmed, goes a saying. So if one can get an idea of the dangers, and opportunities beforehand, To know the personality of a person, the mounts of the various planets represented on the palm, along with the signs, are studied.You will see signs like triangles, circles, islands, stars, and cross, moles, squares and rectangles on the palm. These are of further importance. I have seen that the lines on the palm change, based upon the karmas that a person does. Q. Could you explain us in few words the meaning of Vastu Shastra? A. The existence of the universe is based on the five basic elements of ‘ sky’, ‘wind’, ‘fire’, ‘water’ and ‘soil’. These five elements have to be balanced in our home too. This very art and science of balancing and enhancing these five elements in a dwelling, forms the basis of 'Vastushastra'. Q. Why does astrology exist in so many cultures for so many thousands of years? Which is the inner need that makes people trust it? A. Man has always tried to find out how and why he is here and wants to know what awaits him. Astrology is a method of mapping out the exact positions of the planets in relation to the place of birth of a person at a specific time. This is called the ‘horoscope’. Predictions are made based upon some basic knowledge of the person’s background, as these are the basic points of reference. The horoscope is a guide which tells us about the inclinations of the person in terms of his potential of progressing, or degressing from this basic reference point. And astrology has been able to predict very correctly most of the time, and hence it has been intriguing mankind since ancient times. Q. What people expect from astrologers? A. People are looking for guidance as to what is going on, why it is so and what should be their course of action. Most of the time they want to know the future. Q. How do people in India accept astrology? Are they close to it? A. In India astrology is widely accepted and is part of a tradition that refers to it on all important occasions, like birth, death and all ceremonies and important steps a person takes in his/her life. Q. Can a prediction of yours affects an Indian and a Greek person at the same time? A. Definitely yes. If that means that what I predict and analyse applies to an Indian or Greek. It applies to anyone on this earth. Q. How did you decide to follow the path of astrology? In which age did you start? Did something big happen in your life that helped you take the decision? A. I believe that to become an astrologer is also in your destiny. I wanted to find some answers for myself and had a strong curiosity for astrology and that led me into it. Q. Who was your teacher in astrology? How did he/she help you? A. I was inspired by A.L Bhagwat, who is no more. His writings gave me a head start in the study, later I had many teachers like, V.D. Bhat, and B.B. Shastri, whose teachings and writings gave me a lot of insight. Q. What makes the good astrologer? Is there any special characteristic that somebody should have in order to be an astrologer? A. A good astrologer should be a circumspective, and responsible person, and be able to give a mature and balanced opinion to the person seeking help. He should be studious and try to study various aspects of things. He should understand the spiritual aspect of things, people and events. Q. If you were not an astrologer, what would you like to be? Q. What makes people happy? A. People need appreciation, recognition, and power. The enlightened ones on the path of faith and patience, find happiness in service to others. Q. Which prediction of yours make you feel proud of yourself? A. Many which have benefited people in the way that they were able to handle things better and make necessary changes. Q. We are living an unstable situation worldwide (revolutions in islamic world, European countries in the edge of bankruptcy, immigration problem). What do the planets and stars say about it? Is it a permanent situation or soon we‘ll live in a better world? A. There are many changes that will take place the process of which has already started, and will gather momentum by 2012. In this there will be a transformation, in which there may be natural disasters and artificial ones arising out of hatred or lack of understanding. The world will learn a lot from this, and the new generations will change their outlook for the better. In the north eastern part of India will have a lot of activity and changes in situation. The part to the further east of India will also see big changes. There may be internal uprisings, and unrest. This will affect neighbouring countries as well and relations with them. These changes will later be observed in the west. The changes will be followed by better times. Q. How would you answer to people that say that astrology is not to be taken seriously? A. I would like to say that don't take it lightly atleast. It has always been a topic of heated debate that astrology is blind faith or a systematic method of understanding a person’s life. Astrology has been emulated in the Vedas and is known to scholars since ancient times. It is a method of mapping out the exact positions of the planets in relation to the place of birth of a person at a specific time. This is called the ‘horoscope’. Just as a cardiologist can judge the state of the heart by looking at the ECG, provided he can correlate with clinical findings, an astrologer needs to correlate with the person’s basic points of reference. A horoscope cannot tell the gender of a person, or that what has transpired in the past as there can be numerous possibilities in the absence of any reference point, i.e. the basic correct data of the individual. This has been used to misinterpret astrology and defame it by many so called ‘scientists’, and ‘rationalists’. Man has greatly advanced in science and astronomy. We have reached the planets, and people claim that planets have no such effect upon the humans as astrology describes. Considering this as true, why can we not understand that the position of planets in a horoscope are a graph or a measuring instrument which in its various specific patterns indicate something important for each individual at any point of time? Also we must understand and acknowledge that there are many phenomena in nature that we have not been able to understand completely. That never means that they are untrue! It would be more useful to understand the scope and limitations of astrology in order to gain benefit from it for humankind at large.